The church in London is a part of the fruit of the ministries of Watchman Nee and Witness Lee. There was no one meeting here according to the vision they received from their seeking of the Lord's way and desire until a young couple from Singapore came to London. They had both been raised in the church in Singapore but they came to London so that the husband could continue his medical studies at the university. They began to meet with a group of Chinese Christians but a brother came to visit from the church in Toronto and told them that the Lord would have no way to raise up a testimony here as long as met that way. They had to come out and meet as the church in London. Praise the Lord, they took the fellowship. They began to meet in their home. At first it was just the 2 of them but soon a few more Chinese believers began to meet with them. During this time the husband had to write the Ontario medical exams in order to be able to practice medicine here. He did not take them that seriously and so failed the first 2 times. By the third and final attempt he was desperate. He studied very hard and prayed very hard. When the letter arrived saying that he had passed the exams David was so excited and grateful to the Lord that he took his Bible and hymn book and went down to a local high school and stood outside singing and preaching to whoever would listen. After about a week of this one young man came up to talk with him and eventually got saved and became the first locally born person to meet with them. Soon a young sister and another young brother were also added. In 1974 a Chinese family living near the first couple were all saved in a dynamic way. This brought the total number to about 15 saints. In 1975 the church rented an old store on Adelaide Street and renovated it for a meeting hall. One Lord's Day they had a strong burden to pray that the Lord would bring 2 young brothers who loved the Lord to coordinate with brother David and share the burden of the church with him. At the same time the leading brothers in Toronto and Vancouver fellowshipped together that the church in London should be strengthened and specifically that 2 young brothers should be sent to share in the leadership of the church. When they all met the next weekend at a conference in Toronto and found out that everyone had exactly the same feeling they were much encouraged that this was the Lord's leading. Initially 2 families and 2 single young people came from Toronto and the same from Vancouver. From that time the church began to grow both from saints coming to London from other churches and from local increase. By 1983 there were over 100 adults and an increasing number of children. The hall on Adelaide Street was completely inadequate. The church purchased a building lot on Viscount Road and began construction of a new hall in November that year. Each day the brothers would come to the construction site directly from their jobs and work for about 5 hours on the hall. Some sisters would take turns bringing them a meal. That winter was especially cold and snowy so the brothers still have many stories about putting the roof on in bitterly cold blizzard conditions. Nevertheless, the Lord's blessing was there so that the church was still increasing even during the time when everyone was so occupied with the construction. The hall was finished in May, 1984. That same year another brother who was also a medical doctor invited a Spanish speaking family to a meeting. Within months there were more than a dozen Spanish speaking saints meeting regularly with the church. They were greatly encouraged by some other Spanish speakers visiting from the church in New York City in 1986. This was the beginning of a relationship between the 2 churches involving saints traveling back and forth for conferences each year. Since that time most of the growth of the church has been from unbelievers who received the Lord and from young people who are growing up. By 1994 the new hall was again too small and a large addition was built to increase its size. In 1998 as the number of saints increased to over 200 there was a strong feeling that the church would no longer be able to care for all the needs adequately without some serving the Lord and the church full time. In the fall that year there was a labor in Cleveland for those in this area who wanted to learn to serve the Lord. Eight saints from London were able to participate full time in that labor. In 1999 a number of saints who lived in or near Metcalfe Township near Strathroy began to meet Lord's Day mornings there. Up to that time they had been meeting with the church in London. 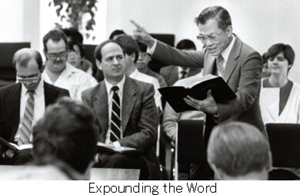 By July, 1999 there were 26 saints meeting in Metcalfe Township and another 225 meeting in London. Since then the Lord gave the ones in Metcalfe the boldness to stand as the church there. We expect and seek the Lord's mercy that the church in London could continue in His blessing to shine as one of His golden lampstands in this dark age. © Copyright - The Church in London. All rights reserved.